Sometimes, the little things in life can mean a lot. That's (literally) the case with the tiny Lego action figure Kirk Gunderson keeps on his desk. 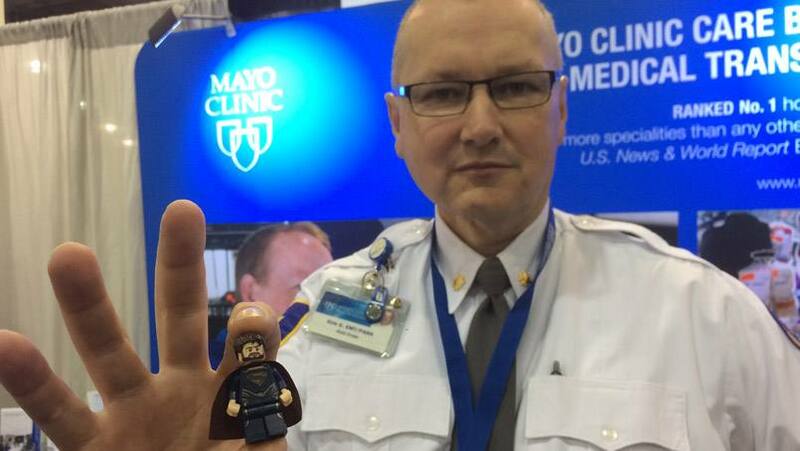 The story behind his Lego friend goes back 3 1/2 years, to when Kirk was diagnosed with salivary gland cancer. The rare cancer led him to Mayo Clinic for treatment. After Kirk's first appointment, he and his wife, Jennifer, stopped at their daycare to pick up their 3-year-old son, Garrett. "He told me, 'Daddy, I'm going to take care of you until you're better,'" Kirk recalls. Garrett then asked Kirk if he had to return to work that day. And while the self-described "very Type A" personality had been planning to do so, "something in me told me to say no," Kirk tells us. Instead, he asked Garrett what he wanted to do. The answer: play Legos. And so they did. "We went home and played Legos, then cars, then went outside. Whatever he wanted to do, we did it," Kirk says. "We did what was important at the time." The experience that day had a profound effect on Kirk. "Something hit me," Kirk says. "I realized I needed to change my life, change my focus. I got hit over the head with the idea of taking time for Legos." A year later, Kirk was asked to speak at the American Cancer Society's Relay for Life in Osseo, Wisconsin, and he decided to share that perspective with others. "Cancer is depressing, and I didn't want to give a depressing talk," Kirk tells us. "So I decided to remind people to take time for Lego moments, whatever that means to them." He wanted to send his audience home with a reminder to make time for those moments, so he decided to buy Lego blocks and hand them out to those who came to hear him speak. Kirk emailed the LEGO Group, explaining his plan and asking if he could purchase 1,000 individual Legos. Lego did make a request with their donation. "They asked me to keep telling my story," Kirk says. He didn't need much convincing. It's a message he often shares, including with those he encounters through his work as a ground operations supervisor for Gold Cross ground ambulance in Northwest Wisconsin. And it's a message that seems to be catching on. "People send me pictures of themselves doing something, and they'll caption it, 'My Lego moment,'" Kirk tells us. You can build us up by leaving your comments below. Then, you can use the handy social media tools atop this page to share this story with others. Great story Kirk!!! We all need to take time for Legos. Thank you Kirk for sharing! I was diagnosed lately with breast cancer and it hit me hard to realise that the kind of life we led is a crazy crazy one with the technology. During chemo session I play sudoko for two hours and a half. It puts me in another world. With your gesture, I will play the lego with my son in between. My son was a smart lego builder at his early age. Thank you for the reminder! Thank you for sharing. Your story is inspiring. Living in the present moment is worth talking about. I remain grateful everyday for the love and strength I receive from my two young children and spouse (and family and friends). Thank heavens for your little one. Children see with the eyes of the heart. As adults, we forget that sometimes. Good luck and best of health.